The Collective Security Treaty Organisation has worked out a set of measures to help end the ethnic clashes in Kyrgyzstan during a meeting in Moscow. “The Collective Security Treaty Organisation has at its disposal all the necessary arsenal of measures to act in similar situations – the peacekeeping contingent, the collective forces of rapid deployment in Central Asia. But they should be used after careful consideration. What was worked out today is a plan of first-level measures to ease the tension in the country and to stop mass disorder in the south of Kyrgyzstan. We are waiting for the President to approve these steps, and we have already agreed on our further actions,” Bordyuzha said. He added that the most urgent need is to help the security forces in Kyrgyzstan by supplying equipment, helicopters, ground transportation and even gasoline. The next steps are to help find the organizers of the clashes and take them to court, he added. Russian President Medvedev said the fact that the security council of the CSTO has gathered and worked out a tentative plan for Kyrgyzstan is a good sign, as earlier “in similar situations we’ve done it a lot slower”. Medvedev also noted an emergency meeting of the head of CSTO states is possible if the situation in Kyrgyzstan detoriates. “The current situation in Kyrgyzstan is intolerable, people have been killed, blood is being shed, and mass ethnic unrest is continuing. This is extremely dangerous to that region, and therefore anything possible should be done to prevent such developments – in line with the law but in a tough way,” Medvedev said. “Sure, it is necessary to help them overcome these problems. 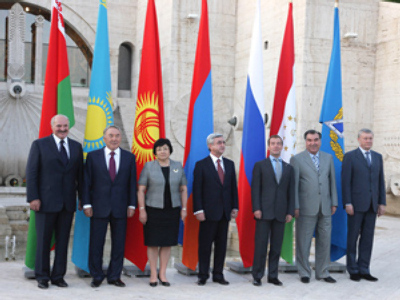 You, the secretaries of the Security Councils of the CSTO member-states, have developed response measures and proposals, and further decisions rest with the heads of state. UN security analyst and crisis communications officer Dex Torricke-Barton hinted that involvement of regional peacekeepers in Kyrgyzstan is much more likely than that of the UN peacekeepers. “I don't think there will be any UN intervention. Simply put there are no nearby capabilities. It would be up to Kyrgyzstan working with its immediate neighbours to put down this unrest,” Torricke-Barton told RT. Analyst Dmitry Evstafiev offered his version of what makes Russia reluctant to react to Bishkek’s plea to send a peacekeeping contingent of its own. “The decision on introduction of peacekeeping forces into a foreign country is a very difficult one. If you make this decision, you undertake a heavy burden of responsibility, because the situation may not be settled only with force. You may need to give economic assistance, undertake responsibility not only for the political stability, but also for political developments,” Evstafiev said to RT.